The exhaust system in your vehicle helps monitor, filter and protect your engine. Ignore any complications having to do with your car’s exhaust system, has lead to many problems for our clients. In fact, ignoring issues when they arise will only turn minor and seemingly preventative maintenance glitches into something much bigger. Your once small problem will easily develop into an expensive and potentially hazardous one later on. You might not realize it, but your automobile will never go kaput for no reason at all. There is always an underlining factor that causes it to break down, malfunction or just stop working completely. When it comes to your exhaust system, the rules are no different. Luckily Northeast Transmission & Auto Repair knows the ins and outs when it comes to keeping vehicles on the road. If you have to turn up the radio to tune out your muffler, it’s time to visit an exhaust repair professional. Loud noises from the exhaust are possible signs of an engine leak and exposure to harmful fumes. Increased fuel consumption is always a sign that something is not right with your vehicle. Your engine must work harder when the exhaust malfunctions. When the engine works too hard have your exhaust system inspected before the problem gets worse. A persistent vibration coming from the steering wheel or gas pedal may be an indication of loose or broken muffler parts and should be promptly checked. Fumes due to an exhaust leak can be hazardous. If you detect a problem, visit our auto repair center immediately and call us right away. The exhaust system in your vehicle works hard to direct fumes away from the engine to keep it running properly. If you experience any of the above signs, contact the qualified exhaust repair experts at Northeast Transmission & Auto Repair for a thorough inspection. 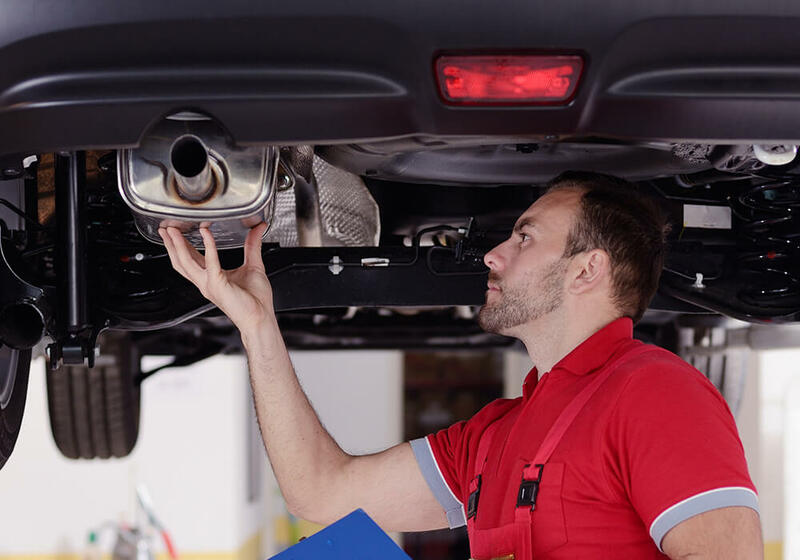 Our certified mechanics are equipped to handle any exhaust or muffler malfunction on any make or model of vehicle. Call us to schedule an appointment or with any questions you may have.